Preheat the oven to 180°C and place a griddle pan over a high heat. Rub both sides of the sourdough slices with the olive oil. Place on the hot griddle and grill until you have clearly defined char lines. Turn over and repeat on the other side. While the sourdough is toasting, bring a pan of salted water to the boil. Snap off the woody ends from the asparagus and cook in the salted water for 2–4 minutes, until tender, then plunge into a bowl of ice-cold water. When cool, drain well and slice into matchsticks each around 5cm long. 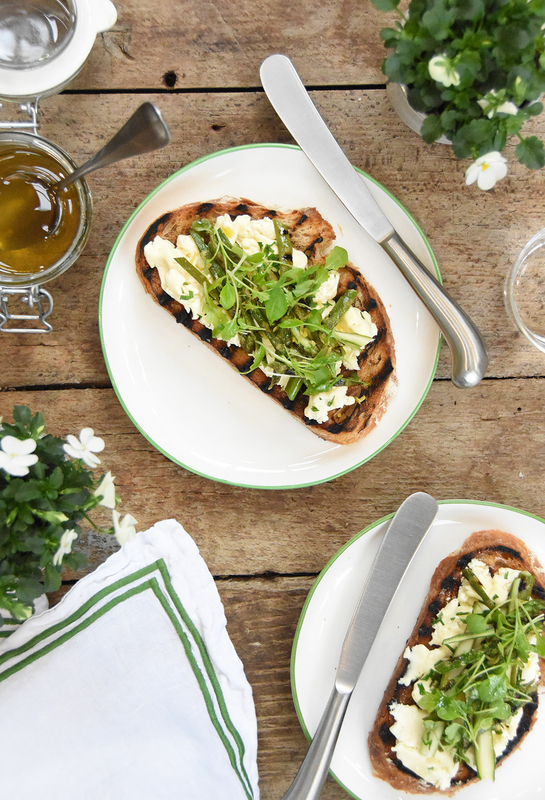 Spread the soft cheese over the toast, arrange the asparagus matchsticks on top and drizzle over the honey. Place on a baking tray in the oven for 5–8 minutes to warm through. Serve each tartine on a plate, seasoned with salt and pepper and scattered with the herbs.